It’s not difficult to travel from the UK to Belgium by coach, and in my opinion, this option is the most affordable and pleasant. London has a very convenient network of coach services to Belgium, especially into Brussels. You can travel from the UK from £15, - with a new Eurolines’s UK periodic special fare. The special fare is available for a single or round-journey. Depending on the route some coaches stop in Gillingham, Folkestone and Dover. From London to Brussels you travel comfortably and conveniently by Eurolines and the journey takes approximately 8 hours, the coach travel from Brussels to London takes up to 7 hours (including a different time zone). Additional information is available from Eurolines directly. From Monday 16 April 2012, megabus.com has begun to operate services from the UK to Boulogne, Paris, Brussels and Amsterdam. Megabus is offering cheap coach (bus) travel from London to Brussels, with fares starting as little as £1. 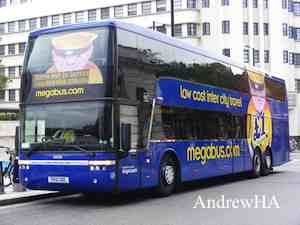 Megabus is a company run by the Stagecoach Group which offers discount intercity bus services in the UK and US. London-Brussels coach: This service runs 2x daily (1 daytime service, 1 overnight service) in each direction. From London Victoria Coach Station the coach travels to either Dover or Ramsgate for a ferry crossing to Calais or Boulogne (included in the price). The coach then makes stops in Boulogne before arriving in Brussels. The London coach actually originates from Leicester and Milton Keynes. The Megabus services depart London at 0900 and 2100, arriving in Brussels at 16:30 and 0610, respectively. From Brussels, the coaches leave at 0015 and 1400, arriving at London Victoria at 0730 and 2000, respectively. Bookings to all new international destinations will be available from many points across the UK with a change of vehicle at London Victoria Coach Station. Passengers will require to check in and provide passport information prior to boarding the coach at Victoria Coach Station before departure for the ferry crossing to the continent via either Dover or Ramsgate to either Calais or Boulogne. Regardless of the port of arrival in France, all services will call at Boulogne to pick up and set down. Megabus one-way international coach fares are currently priced between £1 and £30 - this is exceptionally cheap - in fact, the cheapest way of travelling between the above cities. There is also a 50p booking fee on top. Fares are priced in pounds sterling (£) for British customers and in Euros (€) for Belgian customers. Megabus has purchased 10 new coaches for this European operation which have toilet facilities and free WiFi on board. Wherever else you go in Belgium, you can’t miss Brussels (Brussel, Bruxelles). Brussels capital of Belgium, as well as the capital of Europe due to the EU Headquarters. Whether you are interested in the paintings of Flemish masters, the Atomium - Brussels well-known monument, surrealist buildings and the Royal Palace or just want to try a couple of hundred beers ... Brussels is always worth a visit! Did you know that Brussels is the birthplace of Audrey Hepburn and Jacques Brel? How to buy coach tickets online from the UK to Brussels & Belgium? How is the journey from London to Brussels by Eurolines? Eurolines is a coalition of independent bus and coach companies that operate under one brand name. They serve the majority of European countries, reaching hundreds of destinations across Europe from Ireland to Russia and from Norway to Portugal. Some also serve Turkey and Morocco. Eurolines coaches are comfortable and upscale. 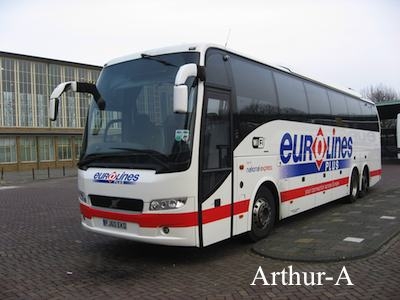 You can reserve a seat online, If your journey begins from the UK, you just go on the Eurolines UK web page, a complete list of operators affiliated with the Eurolines group is available under www.eurolines.com. The Eurolines offices are usually located inside the long distance bus stations, but it can also be a travel agent in the city. Regular European air links services can be checked and booked at www.budgetair.co.uk. Flights connections are available to various destinations in Europe and worldwide. 1 = Operates 14/7 to 28/8. 2 = Operates 15/7 to 29/8. 3 = Operates 3/7 to 19/7. 4 = Operates 21/7 to 4/9. 5 = Operates 1/5 to 30/6 and 6/9 onwards. 6 = Operates 26/5 to 18/9. 7 = Operates 1/4 to 30/9. 8 = Operates 22/9 to 2/10. Amendable and refundable. Available up to the day of travel. inbound journeys are purchased at the same time. To purchase tickets online you can do it directly at the Europebus home page using a journey planner provided. You can also do it on the Eurolines or National Express’ websites. Simply fill out all fields in the journey planner and follow the instructions to buy a ticket. One-way standard ticket from London to Brussels costs from £33. Discounted tickets are also available for children. If you book early and your travel dates and times are flexible, you may get a discount ticket as low as £9 one-way. Early booking is highly recommended because the Eurolines’s route between London and Brussels is very popular and the coaches are fully booked on some days. For most of the connections offered by Eurolines UK, you can make a purchase through our journey planner, located on the front page. Just fill in all fields and follow the instructions. To purchase tickets online, you can also do it directly on the Eurolines UK or National Express website. On the websites, you'll find all the names of larger and smaller towns, cities and airports. The Eurolines journey planner presented below doesn't show all available stations and stops. Note: In some cases, e-tickets may be not available for the journey, this happens when the connections are made with companies other than National Express. You can still buy a ticket online, but it will be delivered by post or it will be ready to collect in the offices of National Express. 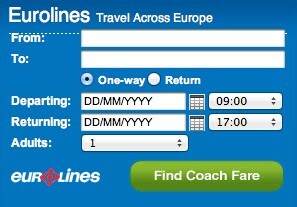 Use this form to book directly with www.eurolines.co.uk & www.nationalexpress.com - all the cheap fares shown. Victoria Coach Station (or Central) is Eurolines's London station. National Express together with Eurolines offer nationwide connections to London, for a simple add-on price of £15 single or return. Just in the box defining the place of departure, enter the name of the place from which you start the journey. London will automatically be treated as a transfer point. Unfortunately, this option isn't available for certain Eurolines connections, so if you won’t be able to purchase a ticket with this option, you must buy two separate tickets. One ticket for access into London by National Express, the second ticket for the international Eurolines route from London. It's easy, buy a ticket online now. Each day this coach operator has up to 7 coach services to and from Brussels. All Eurolines coaches have an on-board toilet and washroom facilities, reclining seats and air-conditioning as standard. Folding bikes are accepted. London to Brussels operates special „Eurolines Plus” coaches, so in addition to the above, you can watch DVDs whilst taking advantage of extra legroom. Sometimes the coach that picks you up from your departure point has only the final destination displayed on the front windscreen. This is because the majority of Eurolines routes include multiple stops and it would be impractical to display every stop on the front windscreen. Also, you may have booked a journey which requires a change of coach. In both examples, please ask the driver to confirm that his/her coach is going to the destination stated on your ticket. Eurolines coach services to Brussels depart from Victoria Coach Station in London which is located close to Victoria Underground and bus stations. Eurolines coaches arrive and depart at the Bruxelles-Nord Station complex. Buy a ticket online now. The carrier provides service to any person who has purchased a ticket. The number of tickets for the designated route is limited to the number of seats. Having valid ticket guarantees you use of the service (seat on the coach), however, it does not reserve any particular place. Single and return tickets (with the indicated date and time) are for a specific journey, you cannot miss the departure because you will lose the ticket. Your luggage should be marked tags bearing a name, address and telephone. Please weigh your luggage at home. Never accept other person's luggage for transport! Should you notice any luggage left unattended, never touch it! Report the fact to the station’s service staff immediately. Never leave your luggage unattended! You need to check-in at the Eurolines check-in office located adjacent to Gate 19. Check in commences one hour before departure and closes 15 minutes before to enable all customers to board and to ensure a prompt departure. You should have your passports and other travel documents ready for inspection at check-in. A boarding card for each customer and luggage labels will be issued and customers will be advised from which gate their coach will leave. Check in time at other UK departure points is 30 minutes before departure. If the office for check-in is already closed, check-in takes place directly on the coach. Buy a ticket online now. You check-in at one of the counters inside the Eurolines bus station. You must check-in no later than 30 minutes before the departure time stated on your ticket. Check-in closes 15 minutes before departure. Sea crossings are made by Ferry or Eurotunnel, check timetables for specific information. On arrival at the ferry port or Eurotunnel, terminal customers will be required to disembark from the coach and pass through both UK and destination country Border Control offices and show their passports. Normally customers are not required to be accompanied by their luggage, however, occasionally Border Control officials do require customers to take their own luggage with them. Refreshment stops Refreshment stops are taken periodically throughout the journey providing the opportunity for refreshment and shipping services used by Eurolines provide a range of shops, restaurants and other facilities. Each customer has a free luggage allowance of two medium sized suitcases, weighing no more than 20 kilogrammes each and 1 piece of hand luggage, which must be located on the shelf above your head or under the passenger seat. Buy a ticket online now. On our Accommodation page, you can book a hotel room or place in a hostel. This is the online hotel reservation system, easy to use. With this tool, you can choose from thousands of hotel offered all over the world. You also save time and money because you don't pay intermediaries. The best way to protect against unexpected accidents is to buy travel insurance. You can insure for travel directly on the Eurolines website, during ticket purchase. You can also insure individual with another insurer. This will be the insurance that will apply during the journey and while in a foreign country. The insurance should cover a loss of cash and goods, cancellation of travel and the main treatment abroad. If you travel several times a year and want to save money, you may want to buy an annual insurance policy. Click here to buy insurance. The official currency in Belgium is the Euro. Do you want to exchange currency? Currency Exchange online. If you're going on holiday, a prepaid currency card is a great item to have in your wallet. Here, we take a closer look at prepaid card option from My Travel Cash. There are lots of great reasons why using one of MyTravelCashs’ currency cards. They've found that different types of travellers use their products for different reasons, so, they've created specially tailored products, for example, Euro Currency Card, US Dollar Currency Card and Multi-Currency Card. Visit My Travel Cash and Post Office Travel Money websites and choose the most convenient option.